Jamie’s latest book is, like all of her books, pleasingly straightforward and easy to follow. She is a master teacher as well as a master at her art, her technique, and her craft. I asked Jamie about tassel making and her book. What is a common problem you see when it comes to making tassels? Jamie: I think that many beaders see a tassel and their mind immediately and simply sees it as fringe techniques stitched up into a bead. Margie: This is true for me! Jamie: The problem with this is that the bead hole will only accommodate the thread a limited number of times and usually that will create only a sparse, feeble tassel. Unfortunately, I see finished designs that clearly would be wonderful with a tassel but what was done was out of proportion with the beaded piece, a few strands indicating a tassel but clearly limited by a bead hole. I am stubborn and worked on techn iques until I could get the appearance I wanted for any tassel with the fullness, richness I desired no matter what limitations the beads and beadwork presented. Margie: That’s what I love about your tassels: they are substantial and robust… nothing wimpy about ’em. Is making tassels as difficult as it appears to be? Jamie: Making tassels is no more difficult than any other kind of beading! And it’s always fun to be able to bead something that you envision in your mind. 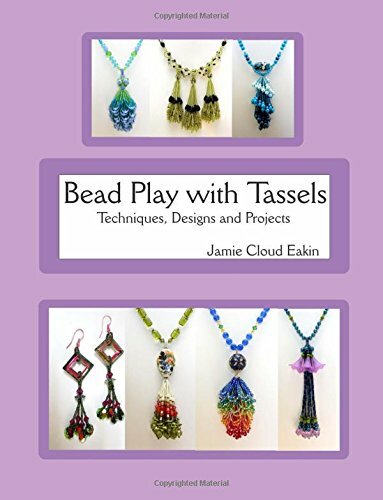 So I’ve included in this book four different methods/techniques for creating tassels, and within each technique there are a variety of different looks you can achieve by changing lengths, bead sizes, fringe styles, etc. Margie: Will everyone find it simple? Jamie: Probably not since I’ve observed over the years that any individual beader can struggle with a particular stitch. But with clear instruction and practice, this is easily overcome. The key with my tassels is using a technique to achieve whatever appearance you desire for your tassel. Some people will find it super easy and I’ve seen beginner beaders succeed wonderfully with these techniques. Margie: I’ve had problems with tassels in the past. I scoured websites for instructions, and the ones I made I was never happy with. As I look at your book, I see now that was because I didn’t have proper instructions. Thank you for adding your clear, practical techniques to the bead artists’ repertoire. Jamie: You are very welcome! « What Do You Want Your Jewelry to Convey?